I made my own confinement wine when I was about 5-6 months pregnant. Mum told me that I would need 10-12 bottles for the whole month. So I made my wine in two batches, which yield around 8 bottles of wine and 4-5 boxes of Red Vinasse. I didn't have good appetite during my confinement and ended up using only slightly more than 3 bottles of the wine. Mum sure wasn't all too happy about it and thought I didn't take good care of myself during that crucial month. I was just too busy with the newborn clubbing severe sleep deprivation, it was just too hard to think about food! 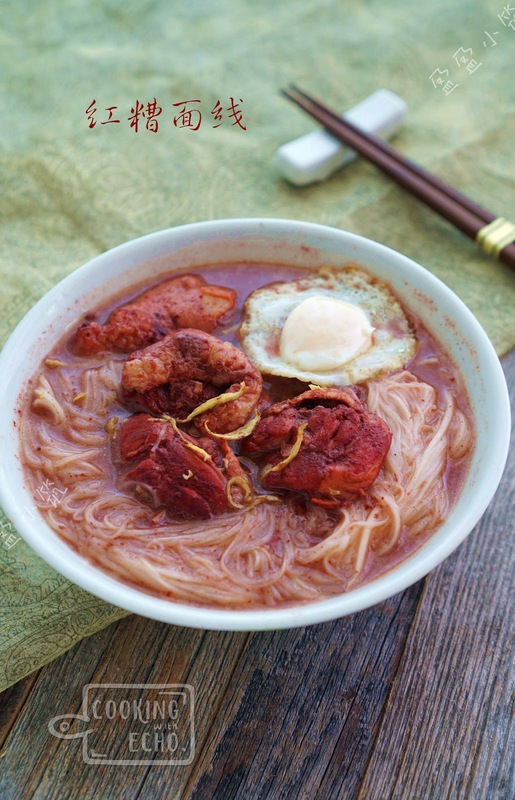 This Red Vinasse mee suah was a typical confinement breakfast that mum used to made, sometimes if I could not finish the chicken mum cooked for lunch, I would request her to turn it into this mee suah for dinner. Thinking about all the things that mother did for me during the first few months of my motherhood and having her around was the greatest gift and support a new mom could have. I was lucky and loved indeed. As I write this, I am missing mum already and is also really excited to announce that mum will be here again next week, I can't wait! 1. heat up 1 tsp of sesame oil and stir fry shredded ginger until crisps. (Dish out and set aside). 2. In the same wok/pot, stir fry a few ginger slices until fragrant, then add the chicken pieces, stir until chicken changes color. Add 1 tbsp of red vinasse and cook for 2-3 minutes. 3. Pour in 2-3 cups of water or stock, bring to rolling boil, turn to medium heat and cook for 20 minutes with lid on. Season with sugar and soy sauce, turn the heat down to low and simmer for 8-10 minutes or until chicken become tender. Add some red rice wine or chinese cooking wine, continue cooking for 1-2 minutes. 4. In a small pot bring half pot of water to boil, blanch the vegetable first, and set aside. 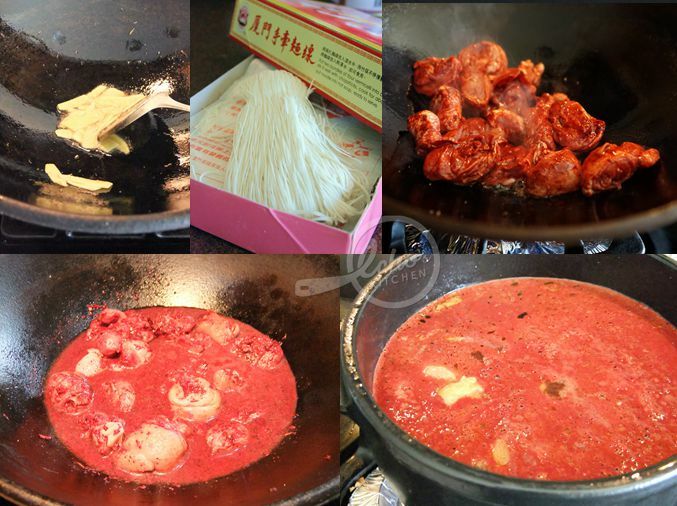 Cook Mee Suah for 2-3 minutes or until around 80% cooked. 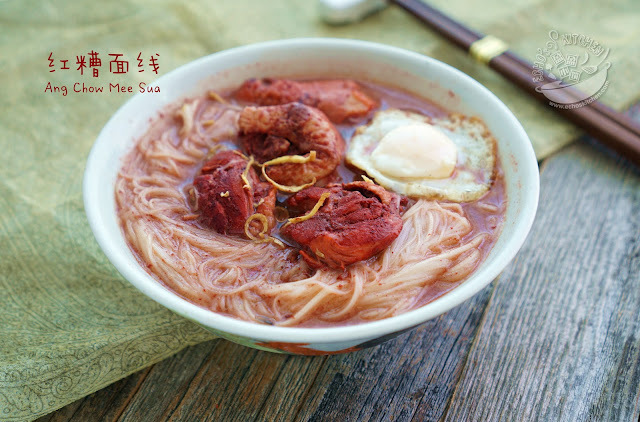 The noodle should be soft yet retain its crunchiness, place the Mee Suah, vegetables, fried egg and mushroom in a deep bowl, add piping hot soup and chicken pieces into bowl. Sprinkle some fried shredded ginger and serve. Note: Mee suah cooks very fast and could become mushy real soon if we are not careful, thus under cook the noodle and let the hot soup continue cooking it once poured over is crucial to retain the texture and shape of Mee suah.